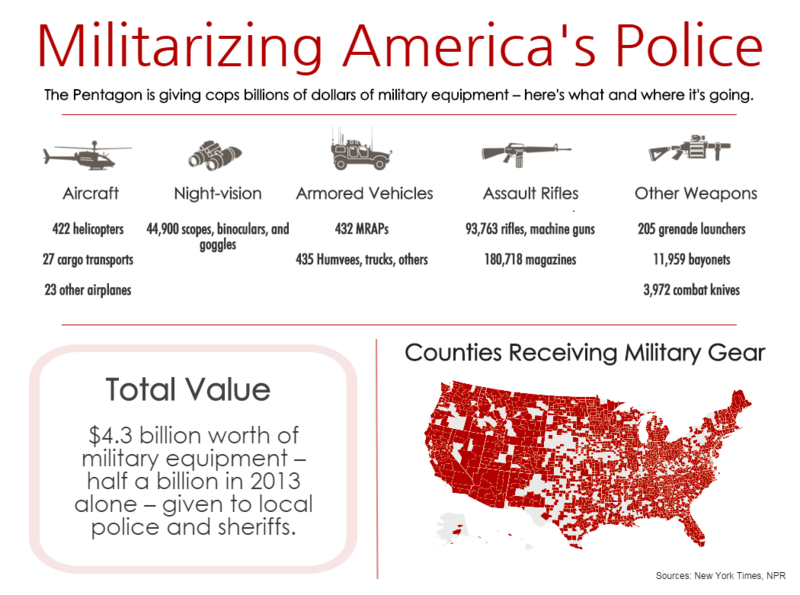 Though police militarization involves many things (most notably a change in attitude and strategy), the visible signs of it — camouflage “battle dress uniforms”, armored vehicles, machine guns, and helicopters — are the direct result of a Pentagon program to funnel unused military equipment to local police. And since the wars in the Middle East have wound down, there is a lot of it. I’ve compiled some graphics and data from NPR, NBC, and the New York Times about the program. *Note that the figures may conflict in some places — NPR says that cops received 79,288 assault rifles; NYT says 93,763 “machine guns”, apparently including assault rifles with other weaponry. NPR says 422 helicopters and 50 airplanes; NYT says 533 “aircraft” total.